The Forum for Interdisciplinary Religious Studies (University of Göttingen) starts a public lecture series on The Emergence and the Fading of the Religious ("Wie Religiöses vergeht und entsteht") on 20 April 2017. On 27 April our director Monika Wohlrab-Sahr will give a lecture on Secularity beyond the West ("Säkularität oder die Grenzen des Religiösen - beyond the West") as part of this series. 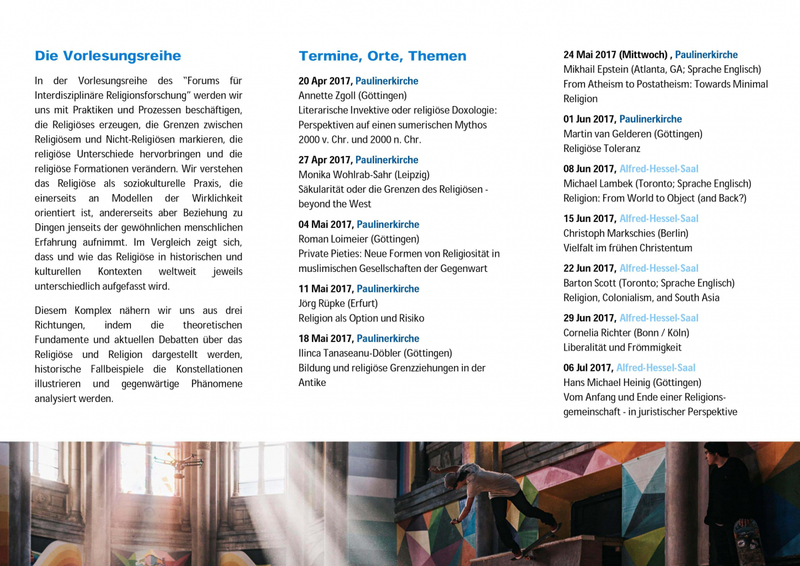 The Forum for Interdisciplinary Religious Studies aims to bring together the many existing and upcoming research activities related to religious studies within the faculties of Humanities, Social Sciences, Law and Theology at the University of Göttingen. It is supposed to provide opportunities for exchange and further development of new research contexts within long-standing, established structures. It is a central component of the university’s strategy to interlink research on religious themes across different eras and disciplines.